Properties in Balboa average 4.9 out of 5 stars. House-mill in Becerrea, Los Ancares, Lugo. My mother-in-law lives in Leon, and I wanted to bring my parents to the North of Spain for the first time, until now, they had only known Spain from beach holidays. They do have a big dog, and he is very friendly, but also very wild. They are interested in history and botany, and enjoy good food and drink. So I searched for a house to rent, with a garden, close to Las Medulas and also Prada a Tope, and found the Casa Canedo. The garden is gigantic and all fenced in, the dog was ecstatic when we got there. There is also a stork nest about 20m away from the house. The one complaint I have is about the beds. I'm almost 2m tall, so my single bed was too small, and my parents also were a very tight fit in one of the 'double' beds, and they are not tall. Apart from that, everything is top-notch. The bathrooms are super-nice, there are bikes to use and there is wood for fires, there are motion-sensors for the lights and radiators that can be controlled electronically individually and there is a good BBQ on the terrace. Don Canedo also has a nice setup with the locals, who will come, and offer to BBQ for you, and the local bakery will drop off a list of their products and you can have them delivered. Sadly, the pool was not yet ready when we were there, but then again, it was pretty cold and it rained a lot , but we still had an amazing time. La Abuela is off the beaten path, but the drive up into the mountains is beautiful and worth the effort. 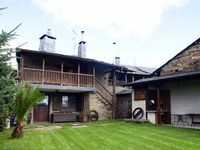 The house is very well equipped for cooking, relaxing and playing in the garden with a gorgeous view. Manuel is very thoughtful with advice, kind offers of help, and local bottles of wine. Our lack of Spanish did not get in the way at all, as he found many helpful interpreters to answer all our questions. We loved the area, especially Ponferrada, Villafranco del Bierzo, Santiago de Penalba, Las Medulas, and the sections of the Camino de Santiago we explored, including the Cruz de Ferro which is an easy drive from San Pedro. We are anxious to return to la Abuela someday and bring friends.